This is a pattern I made nearly 5 years ago. I'm reviving it here with edited instructions. I'm sorry it took so long! The bracelet is made up of a strip of motifs joined together at the second round. A button/bead loop is crocheted and a button/bead sewn at the ends of the bracelet for closure. 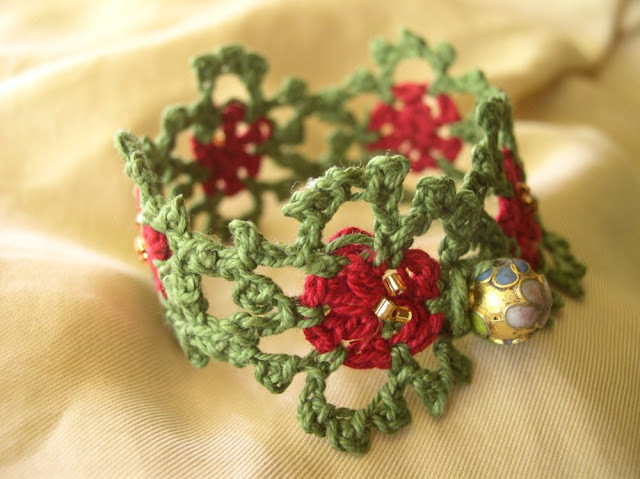 The bracelet can also be completed by crocheting the motifs separately then joining them together by sewing with matching color thread. The bracelet shown is made with five motifs for a length of 6.5 inches. You can adjust the length of the bracelet by using more or less motifs. The standard size for women’s bracelet is 7 inches. It is recommended to starch the bracelet lightly, before adding the beads, to protect it from dirt. You can substitute yarn. Select strong, firm yarn such as cotton, hemp or linen. 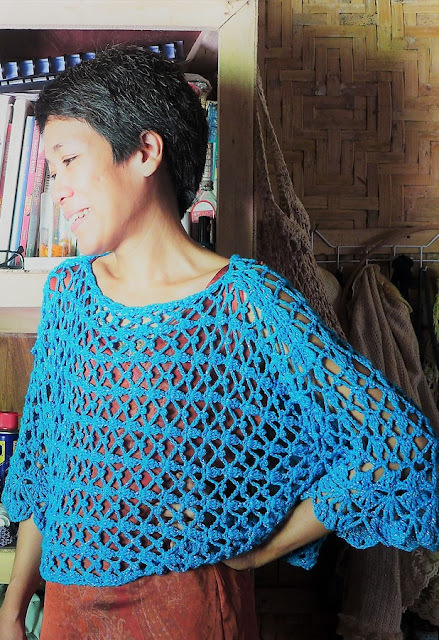 Avoid soft yarns like bamboo, silk or viscose. You can use heavier weight yarn as well such as 4-ply or 6-ply yarn, and you may not need to starch the item. With A, ch 5 (count as dc, ch-1). Rnd 2: Join B with sc to ch-1 sp, ch 1, picot, ch 1, sl st in middle picot of one of the six petals of the first motif, ch 1, sl st in previous ch of working motif, picot, ch 1, sc in next ch-1 sp of working motif; ch 1, picot, ch 1, sl st in middle picot of the next petal of the first motif, ch 1, sl st in previous ch of working motif, picot, ch 1, sc in next ch-1 sp of working motif; *ch 1, 3 picot, ch 1, sc in next ch-1 sp, rep fr * 3 times ending with sl st in first sc to join. Finish off. Continue adding more motifs as described in instructions for making second motif. The model bracelet shown is made with 5 motifs to make a bracelet 6.5 inches long. Join B with sl st to sc at end of bracelet, ch 7 (to make loop for bead/button. ), sl st back into sc. Check if the bead/button fits, and adjust ch loop as necessary, then finish off. With matching color thread sew the bead/buton to the other end of the bracelet. Weave in all ends and block. 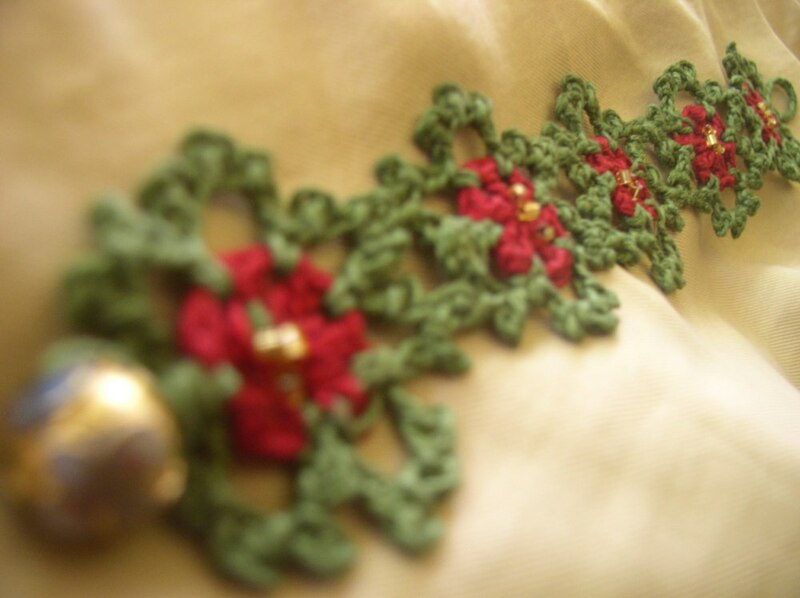 Using burgundy color sewing thread, sew three gold rocaille beads in center of each motif. 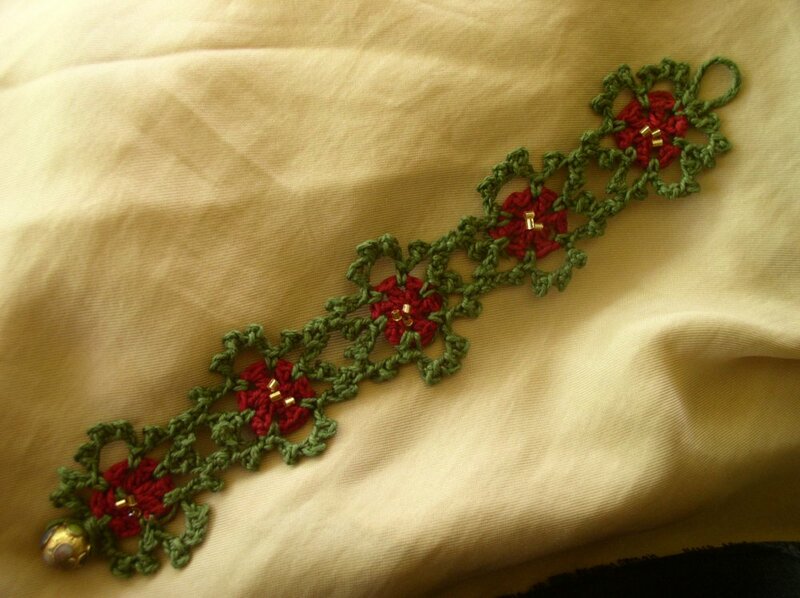 GORGEOUS BRACELET....CANNOT WAIT TO MAKE IT...THANK YOU FOR THE PATTERN!!!! !